Amazon * Kindle * Barnes * Nook * Book Depository w/worldwide shipping * Powells * iBooks * Audio * BAM * Kobo * Indie Bound * Chapters * Hudson * Google Play * Harlequin * Audible Can Beauty tame her Beast? 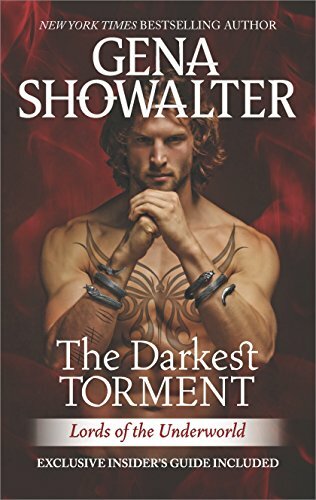 New York Times bestselling author Gena Showalter returns with her most explosive Lords of the Underworld tale to date, about a fierce warrior on the brink of sanity who will stop at nothing to claim the exquisite human with the power to soothe the beast inside him… Driven to his death by the demon of Distrust, Baden spent centuries in purgatory. Now he’s back, but at what cost? Bound to the king of the underworld, an even darker force, he’s unable to withstand the touch of another…and he’s quickly devolving into a heartless assassin with an uncontrollable temper. Things only get worse when a mission goes awry and he finds himself saddled with a bride—just not his own. Famed dog trainer Katarina Joelle is forced to marry a monster to protect her loved ones. When she’s taken hostage by the ruthless, beautiful Baden immediately after the ceremony, she’s plunged into a war between two evils—with a protector more dangerous than the monsters he hunts. They are meant to be enemies, but neither can resist the passion burning between them…and all too soon the biggest threat is to her heart. But as Baden slips deeper into the abyss, she’ll have to teach him to love…or lose him forever. Includes Q&A featuring J. R. Ward, Jeaniene Frost, Nalini Singh and more!